The Year of the Shape, 2018’s celebration of the 40th anniversary of John Carpenter’s Halloween, continues at Spirit Halloween with a new Michael Myers greeter, string lights, and knife prop – (UPDATE) and Halloween H20 door greeter – now available to order online. These are the latest new 2018 products to be revealed from Spirit Halloween this year, following the Michael Myers Halloween H20 animatronic, the Chucky free-roaming animatronic, and the life size singing Sally from The Nightmare Before Christmas that were previously announced, as well as many more original characters, all of which you can see here. 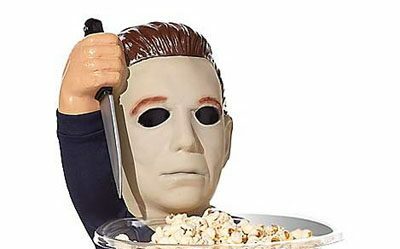 This officially licensed Michael Myers greeter is pictured holding his customary knife in one hand and a bowl of popcorn in the other, though we could easily see replacing the popcorn with sweet treats for trick or treaters on Halloween night. Expected to ship on or before September 30, you can read more specs about the greeter below. Priced at $39.99, you can orders yours here. He’s back… and smaller than ever! The infamous psychotic murderer from the Halloween franchise has returned, but this time he’s back with a different goal: to hold your candy dish! Standing at almost two feet tall and wielding his signature butcher knife, Michael is sure to send trick-or-treaters running… after they grab a piece of candy, of course. The officially licensed Michael Myers string lights feature the classic mask covering each of 10 lights. Expected to ship on or before August 15, you can read more specs about the Michael Myers string lights below. Priced at $29.99, you can order yours here. Decorate for Halloween with your favorite horror icon when you hang up these Michael Myers string lights! Whether you’re throwing a Halloween bash, or the Halloween films just happen to be your favorite, these spooky lights are perfect for all sorts of Halloween fun! The officially licensed Michael Myers Halloween H20 knife prop is expected to ship on or before August 15, and you can order yours here. Also new for 2018, the Michael Myers Halloween H20 door greeter has light-up eyes and plays the classic theme. Priced at $39.99, you can order yours here. What better way to greet your guests this Halloween season than with Michael Myers at your front door?! This horrifying prop features the face of one of your favorite horror icons of all time and white LED lights in his eyes, which may just make a few people jump when they get to your door!